Introducing Suspenders, the thoughtbot Rails template. This will create a project in ../projectname. You should then follow the instructions on GitHub to upload that project there. This script creates an entirely new Git repository, and is not meant to be used against an existing repo. This is funny, because you’re pulling your suspenders. Suspenders was created for use at thoughtbot as a baseline application setup, with reasonable default plugins that the majority (if not all) of our applications used, as well as best-practice configuration options. Thanks to various Boston.rb people and rails rumble people for attempting to use suspenders this past weekend and giving it it’s first non-thoughtbot-internal usage. Rake tasks are contained in the limerick_rake gem. The basic test setup uses Test::Unit, Shoulda, factory_girl, and mocha, and includes some standard shoulda macros that we’ve used on various projects. Factory Girl is a fixture replacement library, following the factory pattern. Place your factories in test/factories.rb. The fixture directory has been removed, as fixtures are not used. Deployment is done using capistrano, and deploys to a mongrel cluster, running under Apache. Rake tasks are provided for managing Git branches which the different environments pull from for deploy. 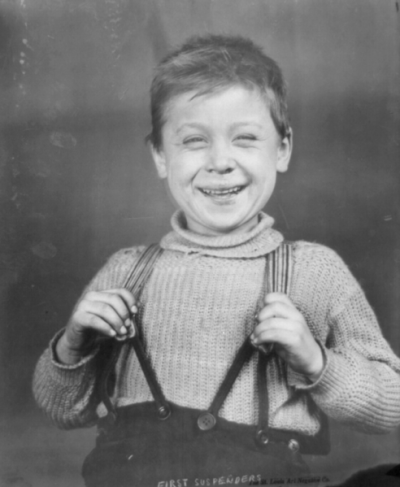 The official Suspenders mascot is Suspenders Boy.